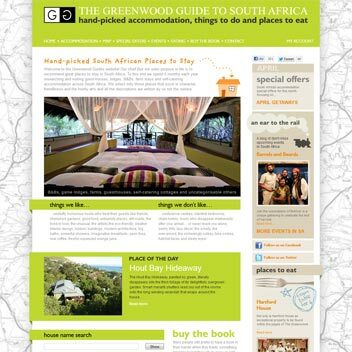 Greenwood Guides is a popular accommodation promoter and guide book publisher. Their direction has shifted over the years and in turn their websites have required frequent attention. The current focus is on their South African accommodation site, which underwent its latest design overhaul in 2012. Later projects include the integration of Google maps and a German language version of the core content. Two distinct CMS (one for internal admin and one for property owners) also regularly demand additional features and maintenance. All running on ASP.net, coded in VB.net and employing a MySQL database. 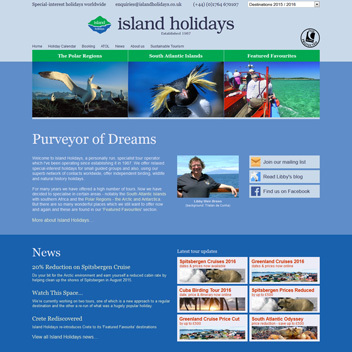 Island Holidays is a small, well-established travel agency based in Scotland, specializing in expedition cruises and guided tours of remote islands and polar regions. Designing a website to be competitive in such niche markets was always going to be a challenge. Since revamping their website for the first time several years ago, the combination of improved user interface, smarter graphics and careful SEO has made a definite impact. The company has gradually gained a stronger web presence and continues to expand their client base through the website. TensileFabric is a leading UK fabric structure designer and manufacturer of both interior and exterior tensioned fabric structures. Despite the fabric structure market being relatively niche, competition is strong with a number of new players emerging over recent years. 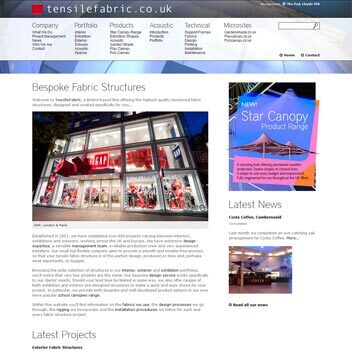 Through ongoing collaboration with the client and periodical website redesign, the most recent in 2014, TensileFabric now has a consolidated online presence with a site that ranks consistently well in Google and generates almost 100% of their business. Streets Alive is a not-for-profit organization whose mission is to bring neighbors closer together by building community spirit, mainly through the promotion of street parties and neighborly activities. 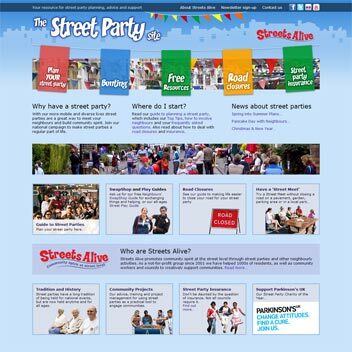 After a series of previous makeovers limited by budget and time constraints, 'The Street Party Site' finally got the attention it deserved. This site is primarily information-based and required a simple layout and street-themed graphics. The front end is supported by a content management system for both news updates and emailing newsletters to registered visitors. Three British naturalists based in different locations around Spain joined forces to inform visitors about wildlife in their respective regions and advertise their guided wildlife tours. With all three experts also being experienced authors, quality content has never been lacking in this website. This has been key in achieving the site's competitive search engine rankings, along with SEO which is always an important aspect of any content changes or updates. 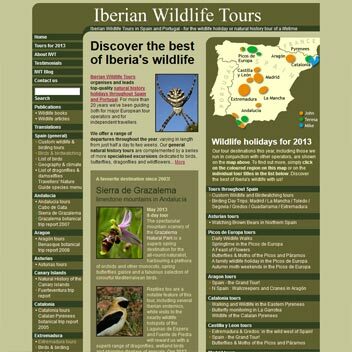 The site includes a custom blog with posts searchable by region, local area and wildlife topic. 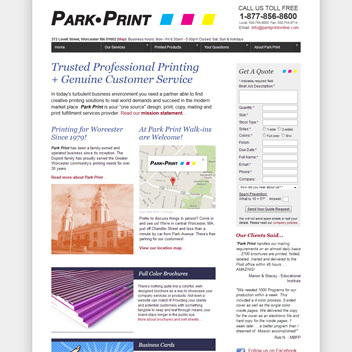 A family-run printing company based in Worcester, Massachusetts, needed a total overhaul of their aging website, which had been essentially untouched for many years. It therefore required a completely new design and rebuild from the ground up. The site content was also completely revised and optimized for search engines. Interactive pages were updated from ASP to ASP.net. The client is also advertising online through AdWords campaigns.